In Taiwan: String Figures, Shadow Puppets! This string stuff is irresistible! 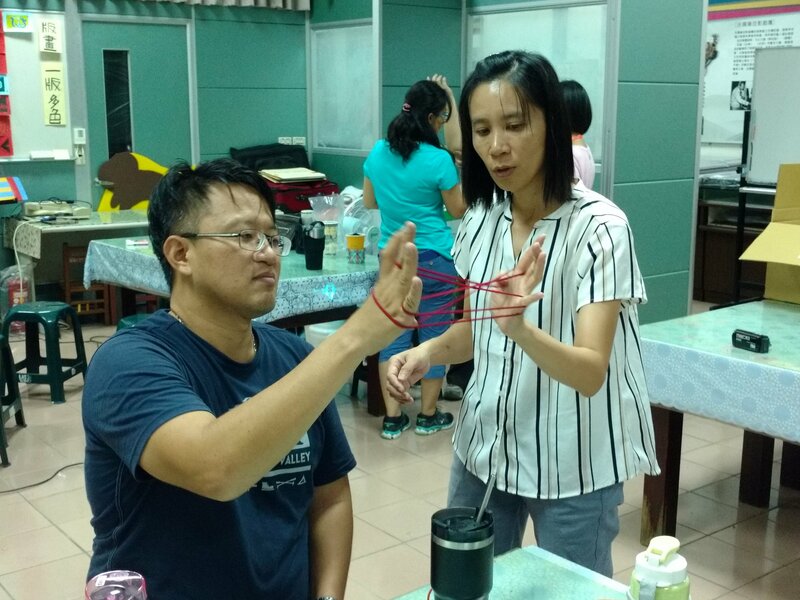 It is Day One of a residency in Kaohsiung, Taiwan, where my intriguing task is to teach string figures as “shadow puppets.” This region is the historical centre of shadow puppets in Taiwan, and here I am in a pilot project to involve young people in this traditional art. 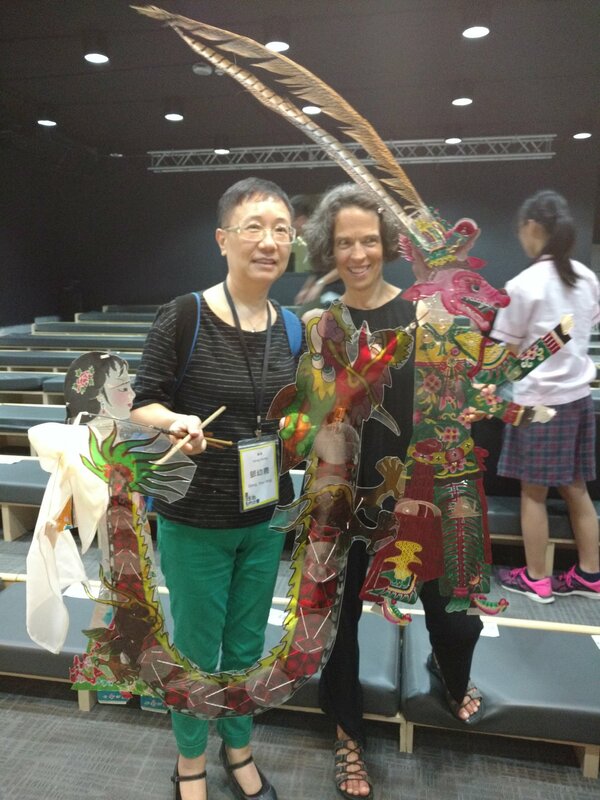 As one of several “masters,” I find myself in the company of people like Hong Kong’s Li Jian Xin and Deng Yo Nong, who happen to be the highest-ranking shadow puppeteers in Asia. Also on board is storyteller and shadow puppeteer Jeff Gere from Hawaii and his wife Dominique (with whom I worked last fall at festivals in Romania). Jeff and I share a group of 21 kids aged 8-12, for 10 days. 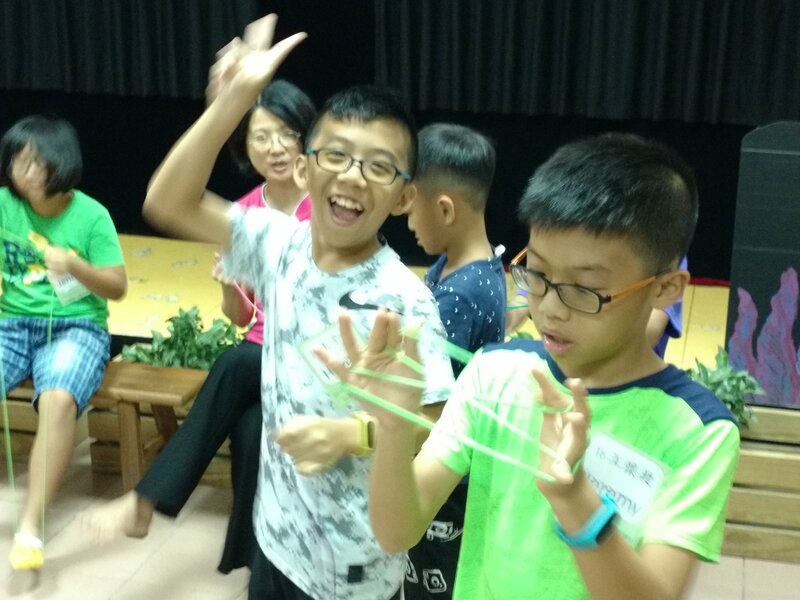 As I launched the kids into the world of string figures, the adult assistants couldn’t resist, and jumped in with enthusiasm. Our stellar translator Yi Jun filled in any gaps, and the room crackled with excited chatter and exclamations of discovery. Tomorrow, the students will teach me about shadow puppets (which they learn at school) and we’ll experiment with projecting string figures onto the screen. I can hardly wait! I gave the students 5 minutes to create a string story. Here’s one of the results. Sharing a string. This made me laugh, because these teachers were so focused I had a hard time getting their attention! At the end of the press conference, I get a rare opportunity to handle the shadow puppet of a true master. Three sticks give me control of the arms and the head, with a special sliding mechanism to open and close the mouth.